The first is a sketch for a triptych, altarpiece or mural. It features a haloed Christ offering a blessing while flanked by two angels. On either side are six haloed figures- perhaps the disciples? The next two are scenes from the Stations of the Cross. 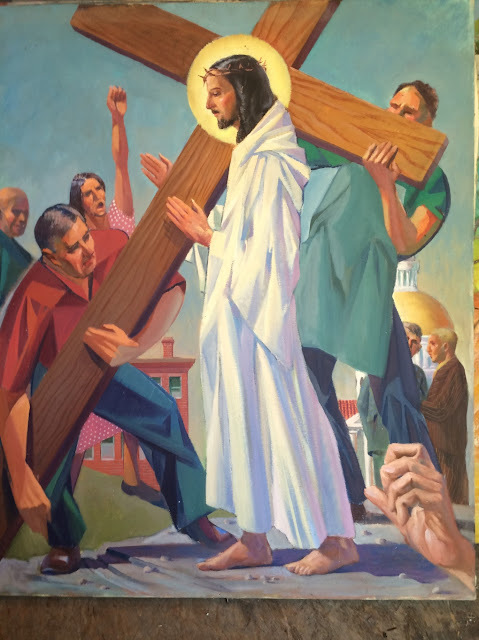 The first painting depicts the fifth Station of the Cross in which a carpenter ,Simon of Cyrene helps Jesus to carry his cross. 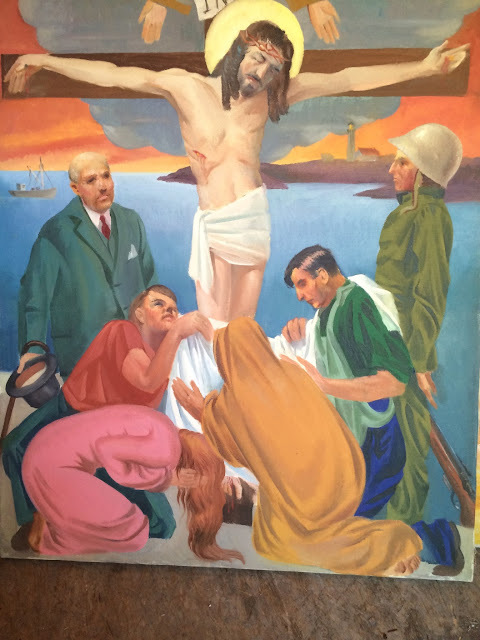 With the exception of the haloed Christ figure the other figures are in contemporary dress and localized it with an urban background including a golden dome. Notable features include a woman in the classic 60’s protest anti-war pose and the hand in the foreground. Hands can be challenging to paint, so this may have been an opportunity to engage in an exercise or to demonstrate his skill. Could it have a special meaning? The second is The 12th station in which Jesus Dies on the Cross. The scene has been localized to the Maine Coast with a lighthouse in the background and modernized with contemporary fashions including a businessman and a soldier. While it may have driven home a metaphor about his town and an outpost of the Roman Empire, it also may have raised a few eyebrows among more conservative parishioners at the time. For perspective, it was not uncommon at the time of the Viet Nam war for some people to vilify the military and sadly use insults such as the term “baby killer.” But, isn’t prodding thought part of what art is for? The fourth is a pencil sketch for a work of Jesus meeting with the Fishermen. He tells them to cast their nets on the opposite side of the boat. And they are rewarded with a bountiful catch. 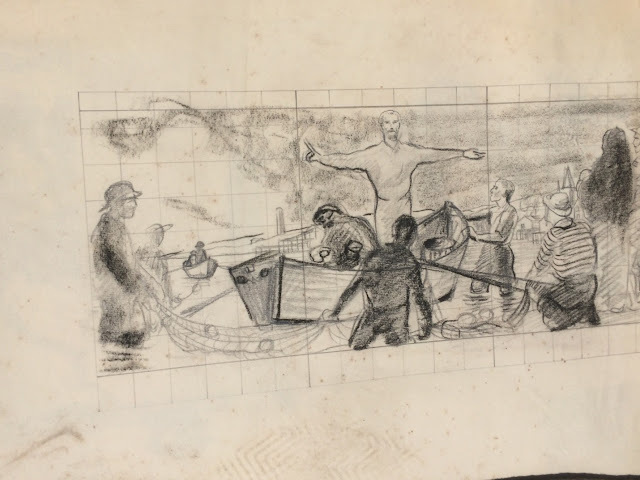 In this sketch he has again localized it by putting the fishermen in modern clothes and making the boats dories that were traditionally used for cod fishing. 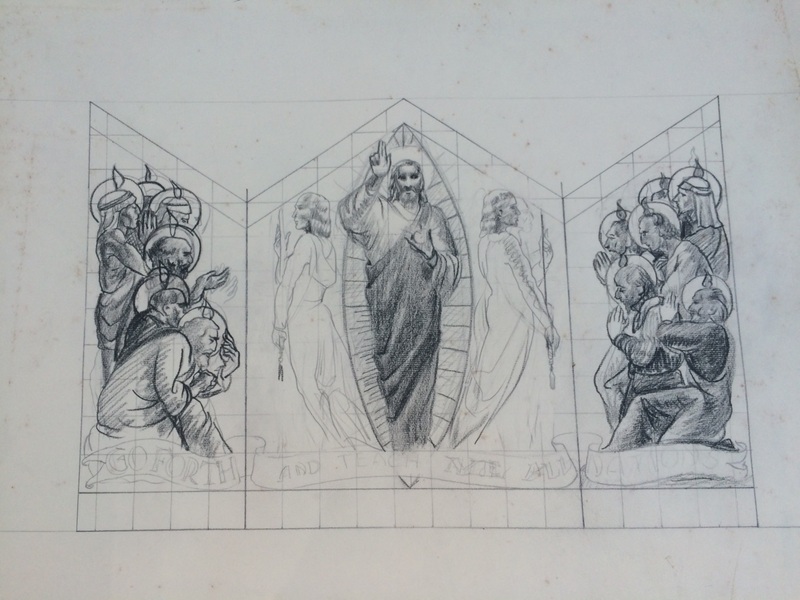 The sketch illustrates the thoughtful work Quirk put into laying out his paintings and positioning the figures. Christ is center in a position that foreshadows his eventual sacrificial death. This image in the collection also struck our eye as a possible image of Jesus.However, we readily point out that Jesus probably did not use a pencil or pen. 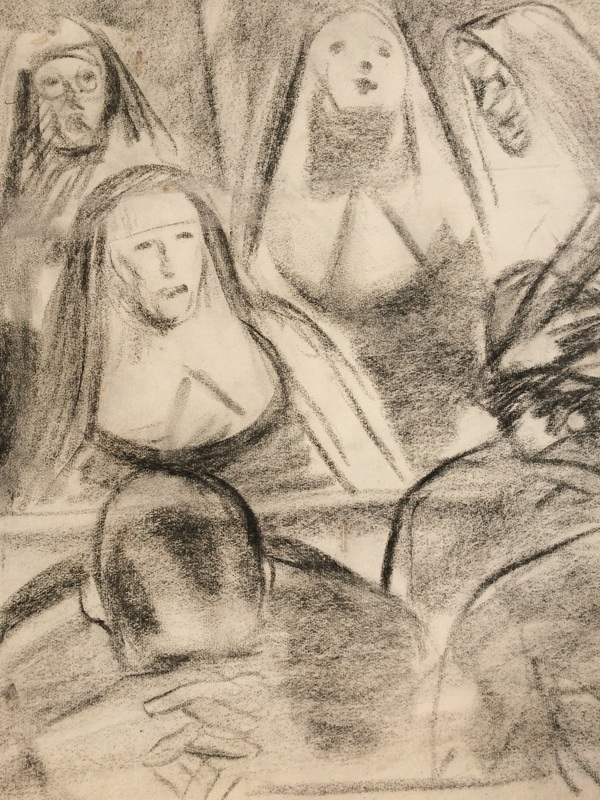 The final work is a charcoal sketch of people praying in church. It includes people praying in the foreground and nuns in the rear.